Chinese style vegetable stir-fry, made with a hoisin-based sauce is a quick and simple vegetarian and vegan stir-fry with a distinctly Asian flavor. If you're vegetarian or vegan, you can never have enough stir-fry recipes to try, am I right? Adding seitan to a vegetable stir-fry makes this a complete one-dish meal perfect for a busy weeknight dinner (and the leftovers make a great lunch, too). Though the recipe calls for seitan, you could substitute tofu with good results and vary the vegetables used as well. This stir-fry has plenty of sauce, so serve over rice or noodles. First, prep your stir-fry sauce. In a small saucepan, whisk together the hoisin sauce, 1 tbsp. sesame oil, 2 tbsp. soy sauce, rice vinegar, sugar, vegetable broth, garlic, ginger, and cornstarch over medium heat. Allow to simmer just until the mixture begins to thicken, about 5 minutes or so, then remove from heat and set aside. 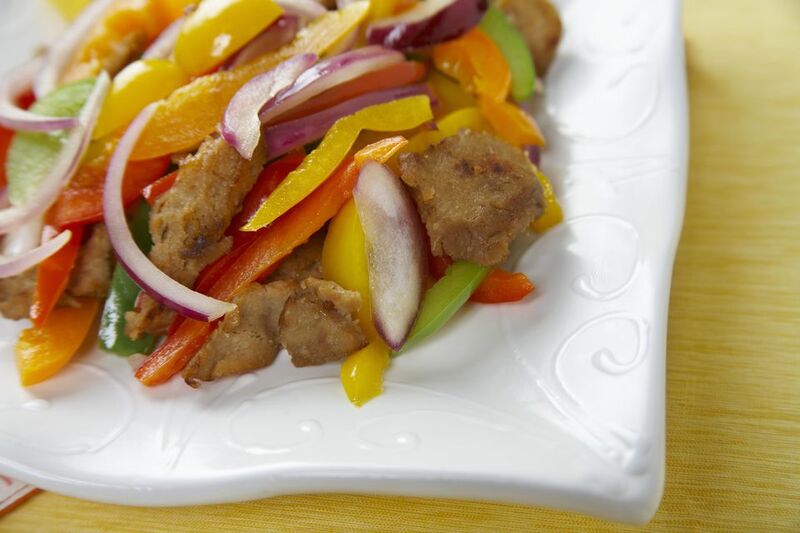 In a large wok or skillet, stir-fry seitan in 2 tbsp. sesame oil and 2 tbsp. soy sauce until lightly browned, about 3 minutes. Add the onions, pepper, and broccoli and stir-fry 2-3 minutes longer. Add the prepared stir-fry sauce mixture to the stir-fry and combine well, allowing to cook 2-3 minutes more, until broccoli is done. Serve your Chinese vegetable stir-fry over cooked rice or noodles, if you like, or plain steamed white rice or your favorite whole grain, such as quinoa. There's plenty of sauce to spread around. Yum!